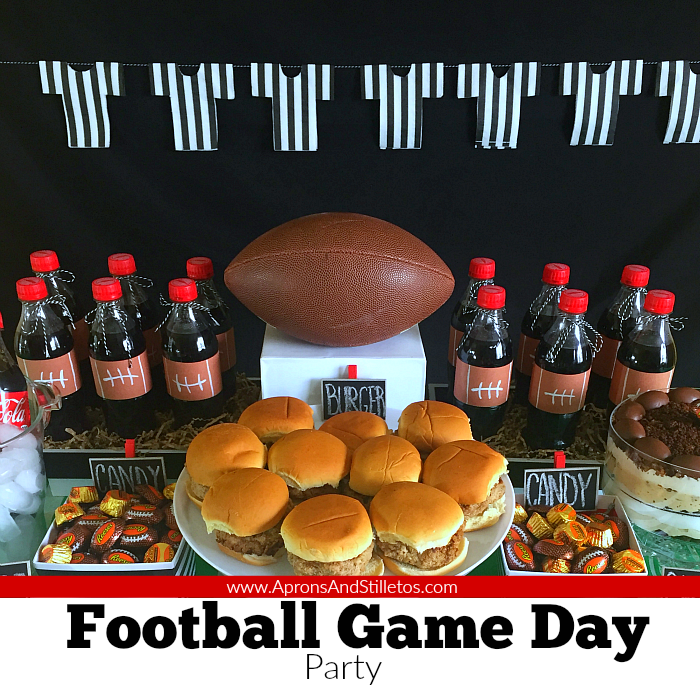 I am super excited to finally share my football game day party plan with you. It was fun having you involved with the planning process through LIVE Periscope videos. Thank you for joining me on my party shopping trip in Target and for your ideas as I made my DIY bottle wrappers live on Periscope. Today I’ll share how I pulled this party together, but first, I want to gift you the party planning printable I created. I use it to map out all of my parties and as promised, I’ve uploaded it for you. You have made this party so fun to put together. Let’s get started. The first thing you should know is I love to plan frugal parties. I do that by making economical menu choices and getting crafty with my decorations. To stretch the food budget for a medium size crowd, I make the main dish using ground beef, chicken or turkey. For this party, I used ground turkey to make the moistest, and most flavorful burgers you’ll ever have. The method I use to flavor and moisten my burgers will shock you, but please trust me. 1. In a large bowl, crumble your ground meat, then add in the bread crumb, season salt and chili powder. 2. Now, make a well in the center of the ground meat and pour in 12 ounces of Coca-Cola. Mix everything together and begin forming burgers. 3. I divide my meat mixture in fourths and make four burgers from each section. Next, I brown the burgers on a hot, greased griddle for about 12 minutes per side. Use a meat thermometer to make sure they’re cooked perfectly. Take a look at these pretty burgers. The burgers were served with ice cold Coca-Cola, and fresh veggies with ranch dip. For dessert I filled bowls with candy and made a no bake trifle. I found the perfect candy for the party at Target. 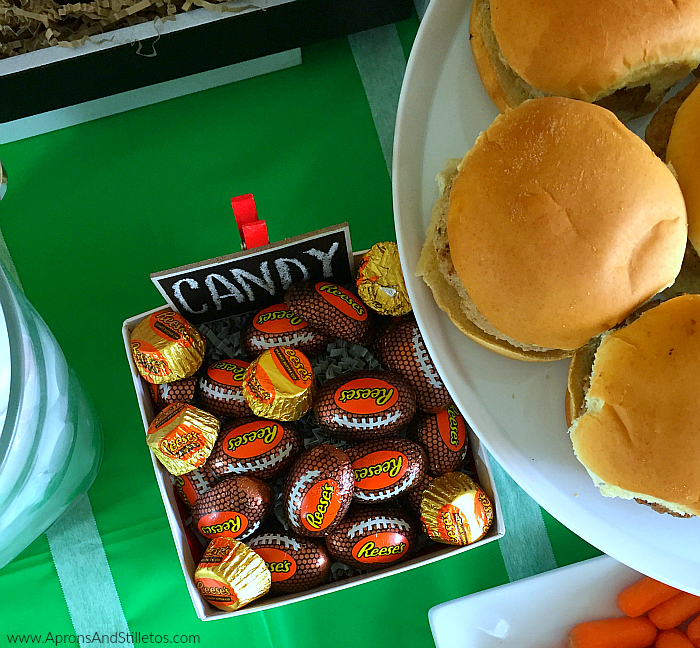 I used the limited release REESE’S Footballs which were perfect for my football themed party. 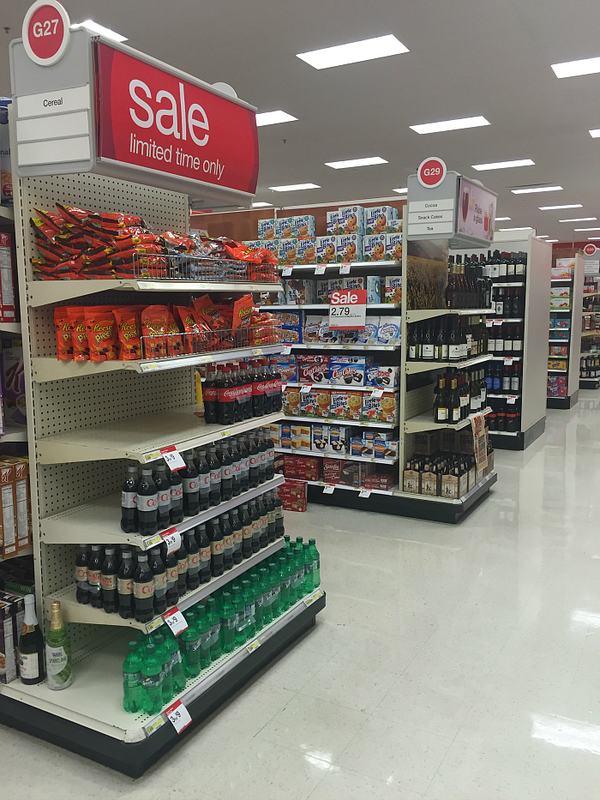 I found the REESE’S Footballs and REESE’S Miniatures used in my recipe, on an end-cap display in the grocery section along with the Coca-Cola. You already know I’m all about savings, so I check the Target Cartwheel app to see if there were any coupons. I shared links and details below for the ones I found. Save on Coca-Cola, Diet Coke, Coke Zero, and Sprite 6-Pack 500ml Bottles. Exclusions: excludes all other sizes. 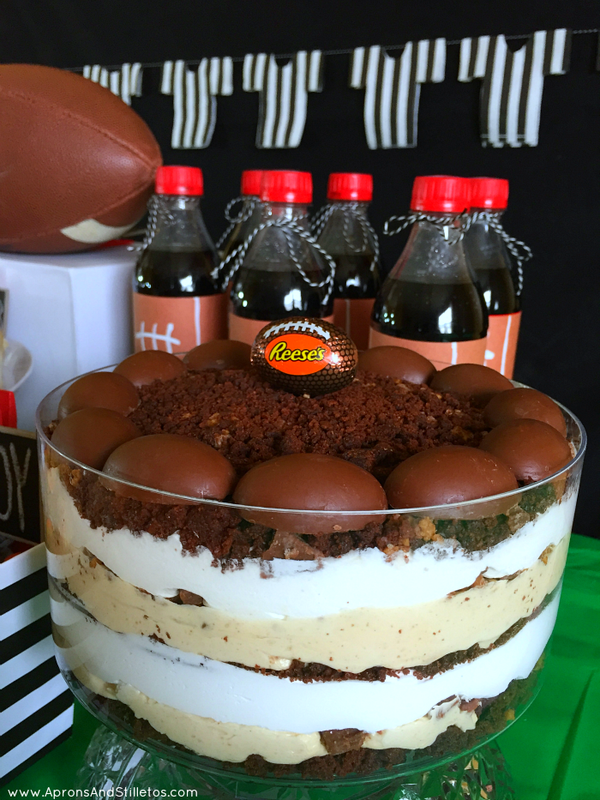 Using both the REESE’S footballs and REESE’S Miniatures, I made a REESE’S Peanut Butter Cream Trifle. 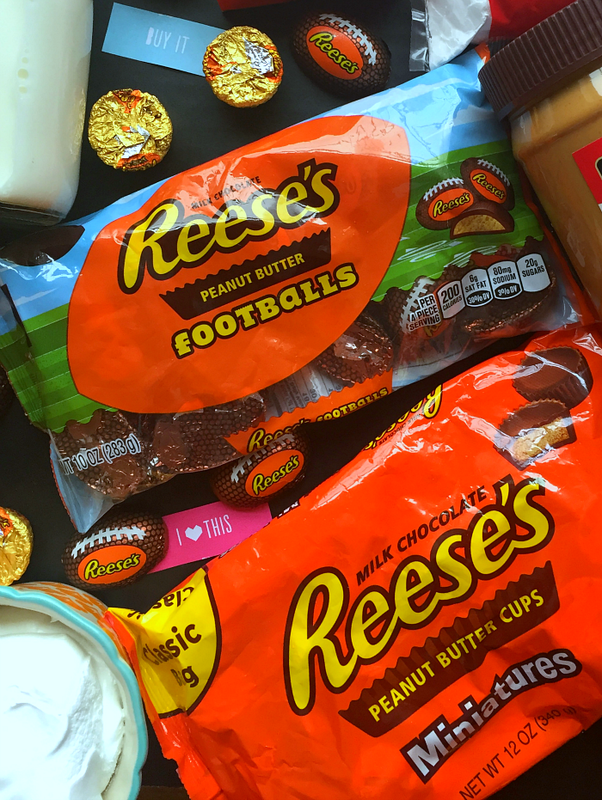 Limited Time REESE’S Footballs – 10 oz. 2. Remove 12 ounces of REESE’S Miniatures from their wrapper and chop. Set aside in the fridge. I placed a layer of brownie crumble in the bottom of the trifle dish. Then added a layer of the peanut butter cream cheese filling on top. Next, I sprinkled some of the chopped REESE’S Miniatures peanut butter cups over the filling. To finish off the dessert, I covered the top with chopped REESE’S Miniatures peanut butter cups and crumbled brownie. 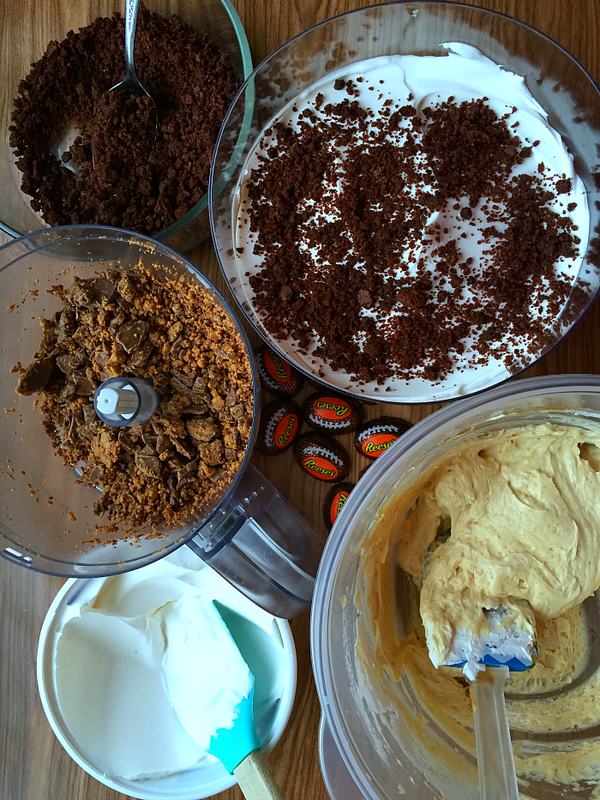 Next, I lined the circumference of the trifle bowl with Limited Time REESE’S Footballs candy pieces. To finish things off, I placed a wrapped REESE’S Footballs candy in the center held in place using a toothpick. I know I’ve shared a lot with you so far, but I want to make sure you can recreate this party. What I used for the decor will blow your mind, it’s so easy. 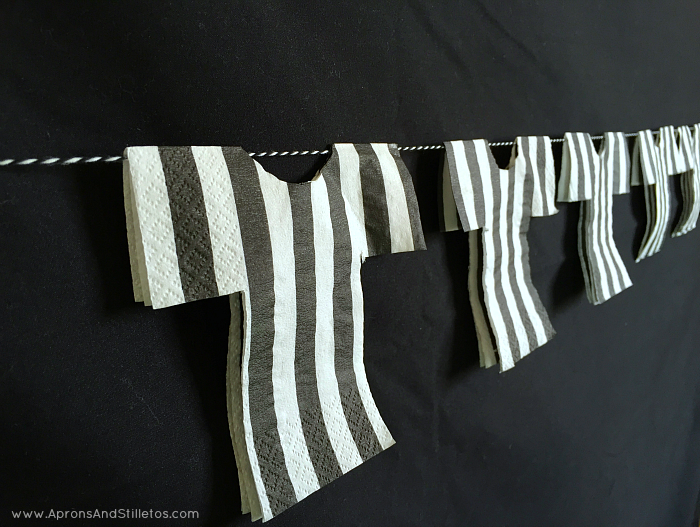 To create a focal point on the wall behind the party table, I made this simple banner for under $1 using this tutorial. 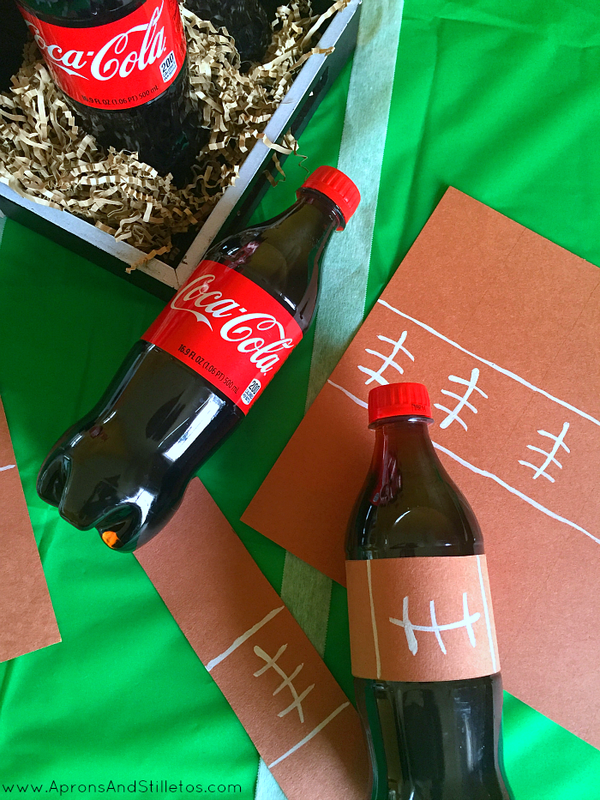 To make these football bottle wrappers I used brown construction paper and white out. I cut individual strips and then strategically drew whites lines on them to resemble a football. To decorate the table, I used a green, plastic table cloth and white tape. I attached the white tape a few inches apart to make it look like a football field. I used food labels for the food. I don’t know why, but I love seeing labels on food. I think it keeps people from having to ask what something is especially when foods are in covered dishes. I used some mini chalk labels which I think are so cute. I had such a fun time sharing my party with you and hope I inspired you to try putting one together. 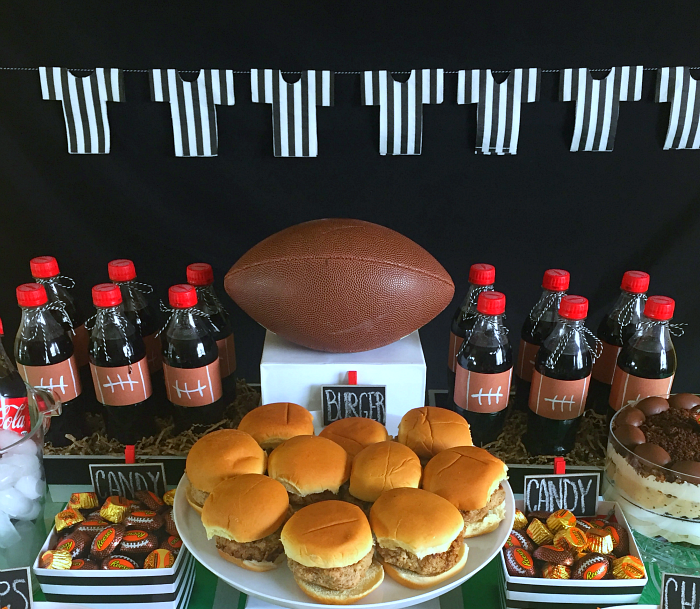 For more ideas on how to throw a fun “Home Bowl” football party, check out my last game day party and don’t forget to get your Target Cartwheel savings on your party items. The trifle sounds delicious. Interesting idea of using coco cola for moistening the meat. Omg what a cute party setup!!!!! I'm just loving those soda bottle labels!!!!! This is so perfect. I love everything about the decor and the food. 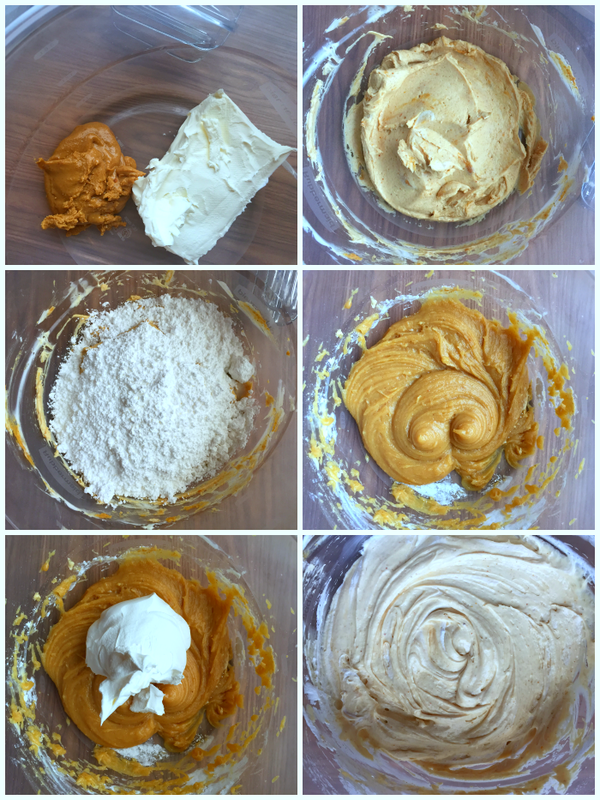 I've never tried turkey burgers…but know that they are healthier. The Reese's treat look amazing. Great table scape. How adorable?! This looks so fun and the recipes look/sound delish! I'm not much of a football fan, but I'm down for any reason to throw a party! Definitely saving the burger and trifle recipes…yum! Omg that looks so coll and delicious, great ideas! Thanks for sharing these recipes. Wait, does this mean your meat tastes like Cola?! Oh man! I want to head to your house right now! Everything looks so tasty and your decorations are amazing. You are inspirational! I love the banner, but super excited for your downloadable party planner sheet! This is genius! Your trifle looks amazing! I can't wait to try that bad boy! 🙂 Thanks for so many cute and affordable ideas! I don't usually do a party. It's just family and junk food but I like the pb trifle and the mini burgers would help fill us up too. 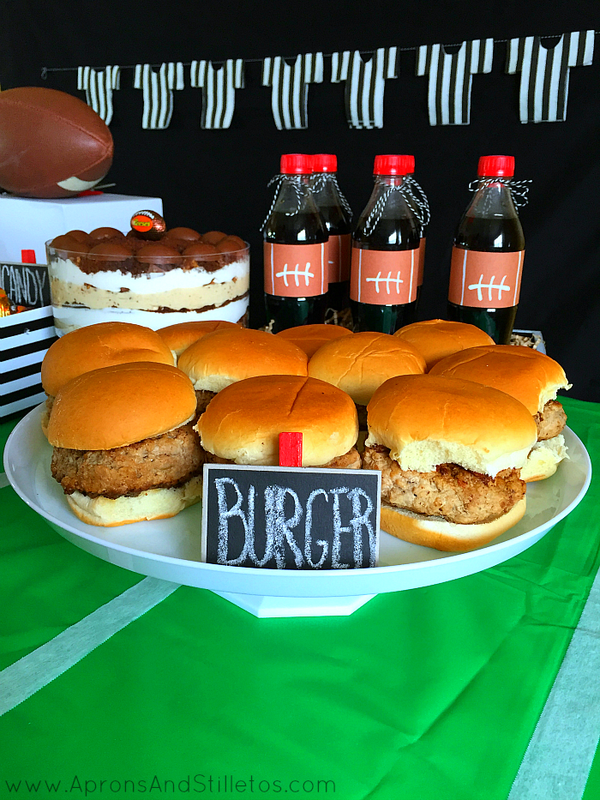 I don't watch football, but I'd make all this because I do love to eat. That trifle looks so amazing! 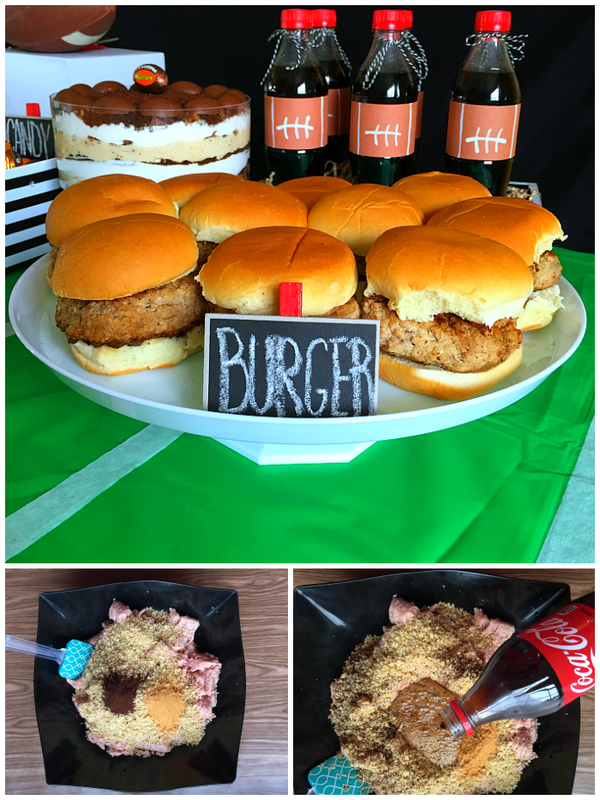 These are just amazing birthday party food ideas and those Turkey Burgers are looking very delicious! I would love to give a try to party food like this on the next holiday party. I am sure kids will love it. These are some awesome party ideas. They are perfect for getting everyone together to watch the big game. I wish I could take my whole family with me and go over to your house for game day! Everything looks fantastic! Such cute and simple ideas! 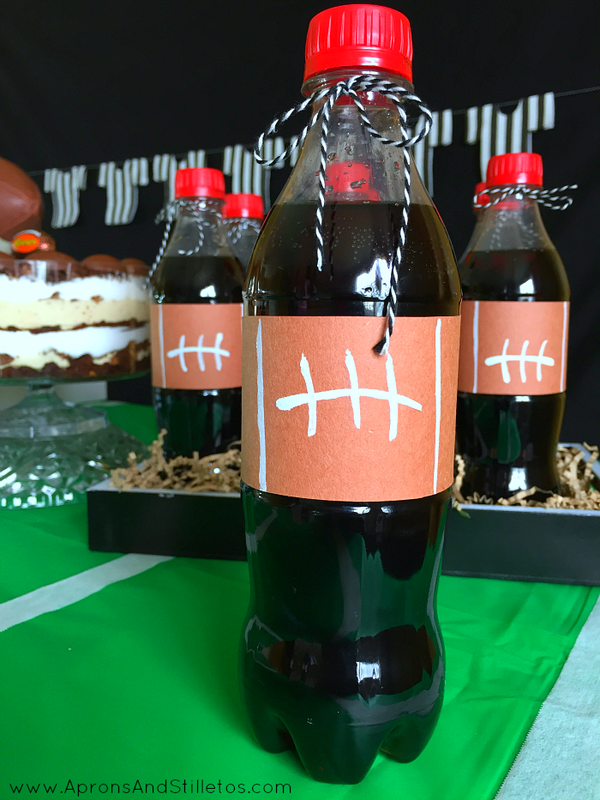 I love the idea for decorate soda bottles to look like footballs! This is an absolutely adorable party! I want to come!! I have never heard of putting the cola in the burger but they look delicious so I am going to have to try it. Next Post What Journals and Planners Do I Use Everyday?